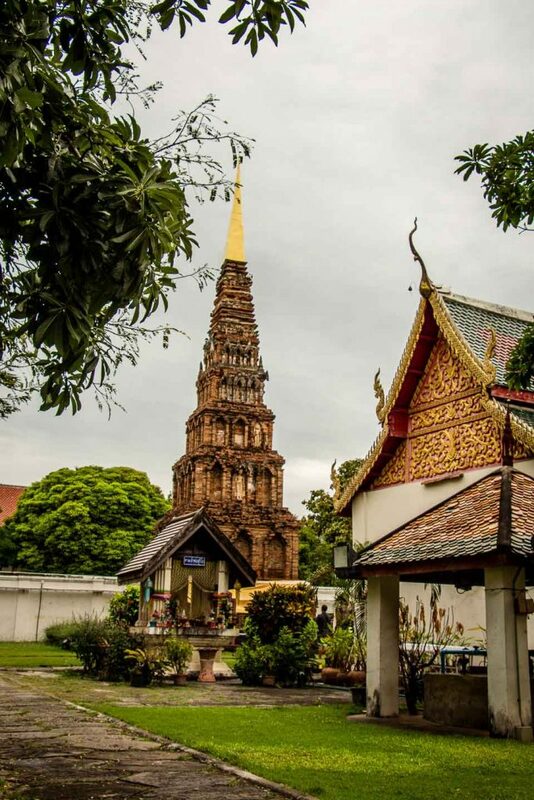 Most people travel to Chiang Mai to enjoy outdoor activities in its beautiful setting. 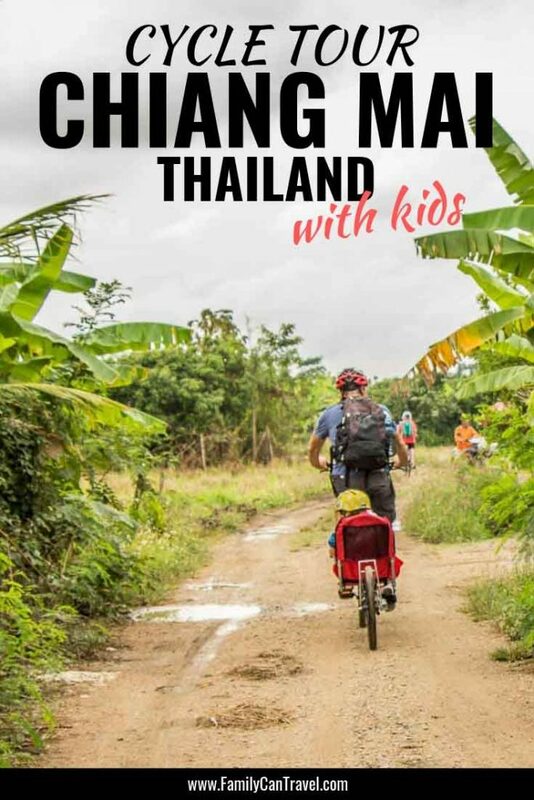 We were really hoping to go for a Chiang Mai bike tour in the countryside, but we weren’t sure if we could find a tour operator with cycling equipment for kids (ours were 3 & 5 years old at the time). 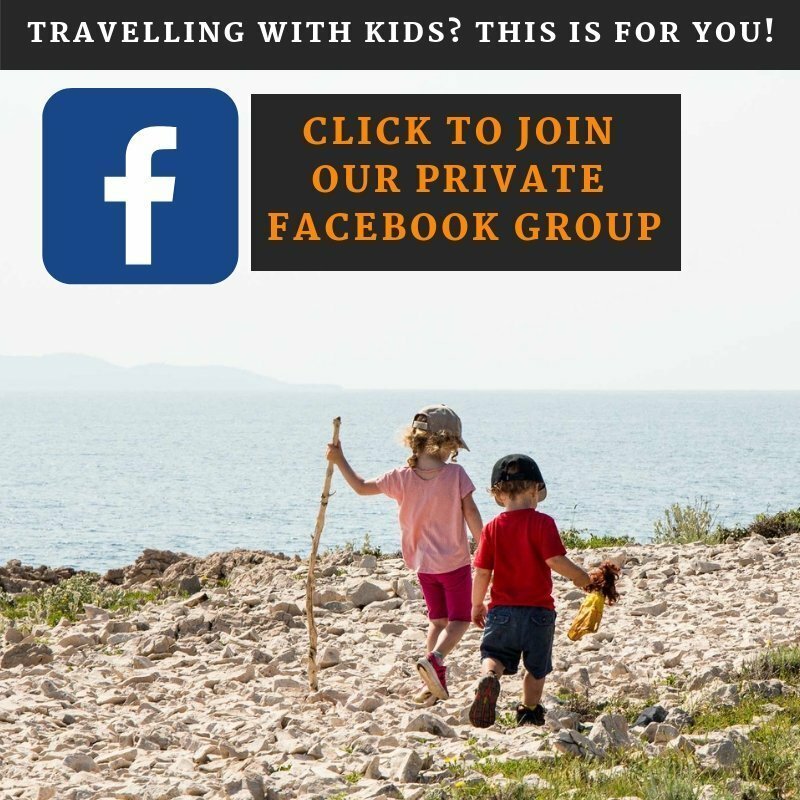 We were very happy to find Grasshopper Adventures as they offer family-friendly bike tours with quality equipment for small kids. 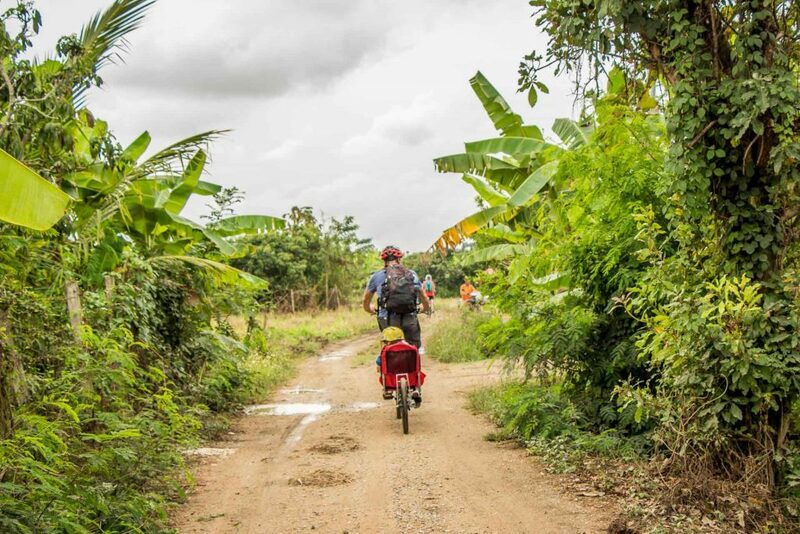 Their 35 mile (57km) day trip called Chiang Mai Countryside by Bike was exactly what we were looking for. 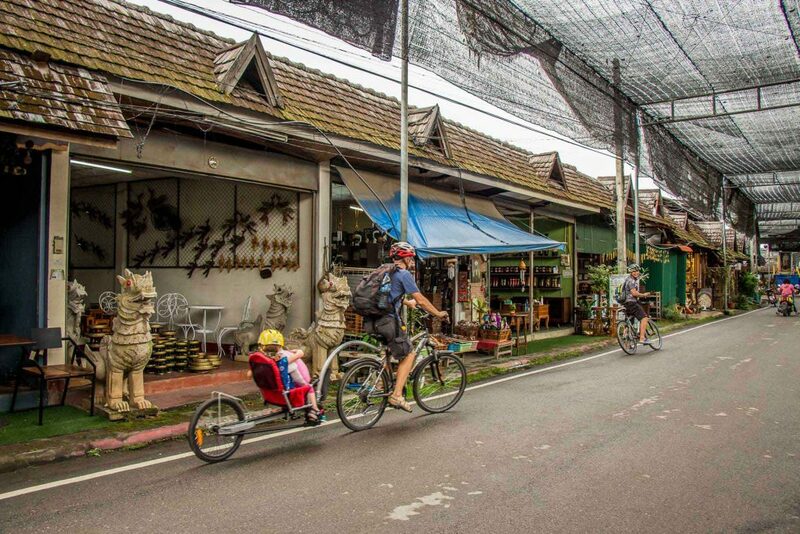 As soon as we arrived at Grasshopper Adventures shop, they immediately started getting our bikes and equipment ready for our day of biking in Chiang Mai. Celine and I were provided 18 speed mountain bikes (I didn’t realize how badly my bike back home was tuned until I started changing gears with this bike – they were perfect). They set up a WeeHoo Bike Trailer on the back of my bike for our 5 year old daughter and a child seat on Celine’s bike for our 3 year old son. Our daughter had never used a WeeHoo before and had a great time back there, spending most of her day waving at locals and singing songs. We were very impressed with the quality of our equipment. 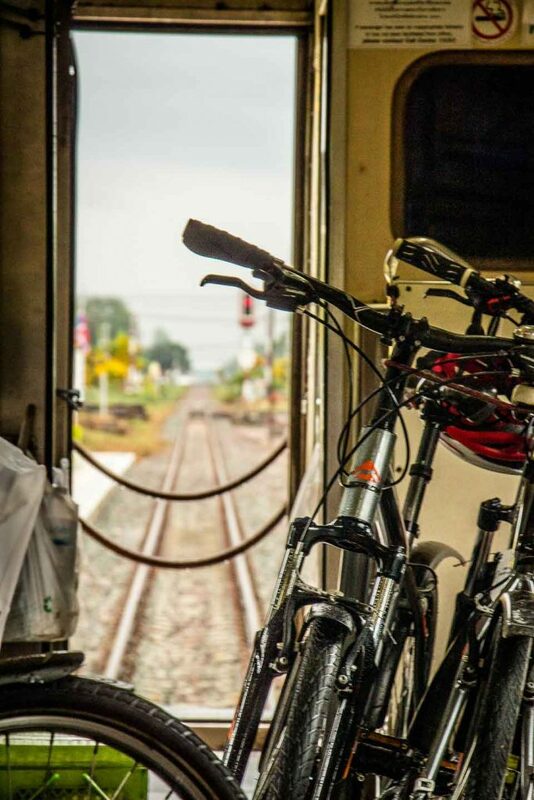 Our Chiang Mai cycling tour began with a short ride to the train station. Given Chiang Mai is a city of 1.5 million people, it’s hard to avoid busy streets altogether, but our guide Gun quickly led us off the busy roads and onto some quieter side streets. We really appreciated Gun’s focus on the group’s safety – he always made the extra effort to ensure that we crossed roads safely by stopping oncoming traffic. He even went as far as to use his bike and body to fend off the occasional barking dog to make sure we all got by safely. Talk about going the extra mile! Our train was already at the platform when we arrived at the train station. We rode our bikes right up onto the platform, handed our bikes to the train attendants and within minutes our train was on its way. 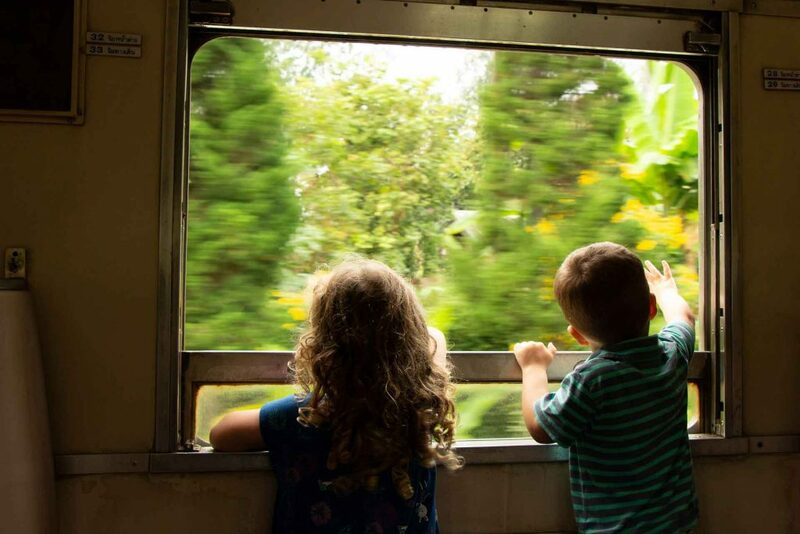 The train to Lamphun was a simple 2nd class train with wooden seats and windows that open. We sat across from a few monks, which the kids thought was pretty neat (and the monks seemed to enjoy as well). The scenic countryside we passed along the way was foreshadowing of the day to come. Lamphun is a reasonably large city of a half-million people, but it seems so sleepy and quiet compared to the madness of Chiang Mai. The roads were so relaxing and enjoyable as we rode towards Wat Phra That Hariphunchai. 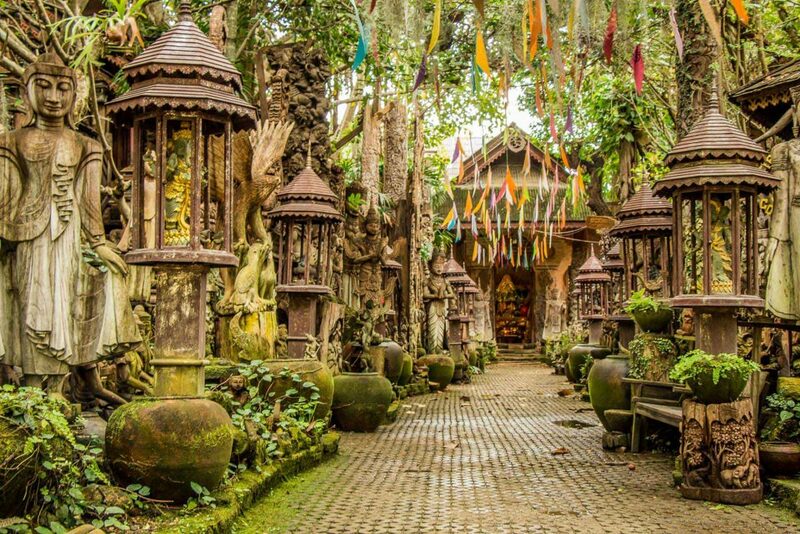 This temple is every bit as beautiful as what you see in Chiang Mai, but without the tourists. 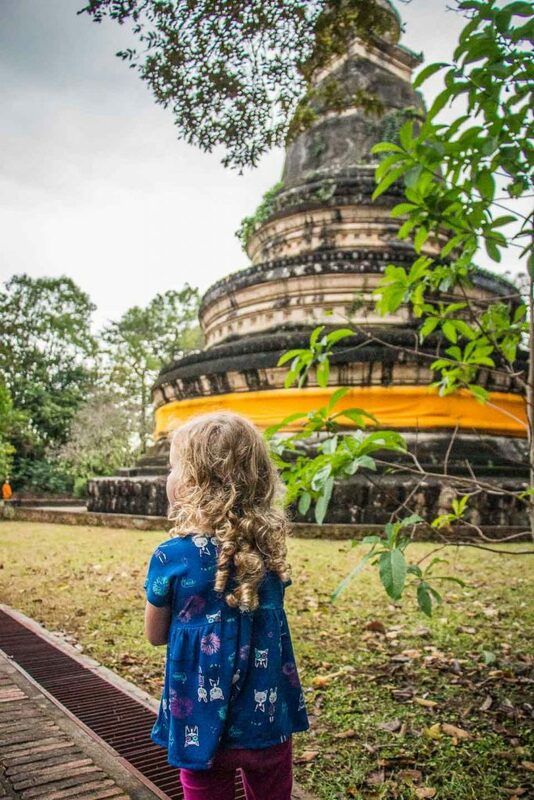 The central stupa at this temple was originally built over 1100 years ago! 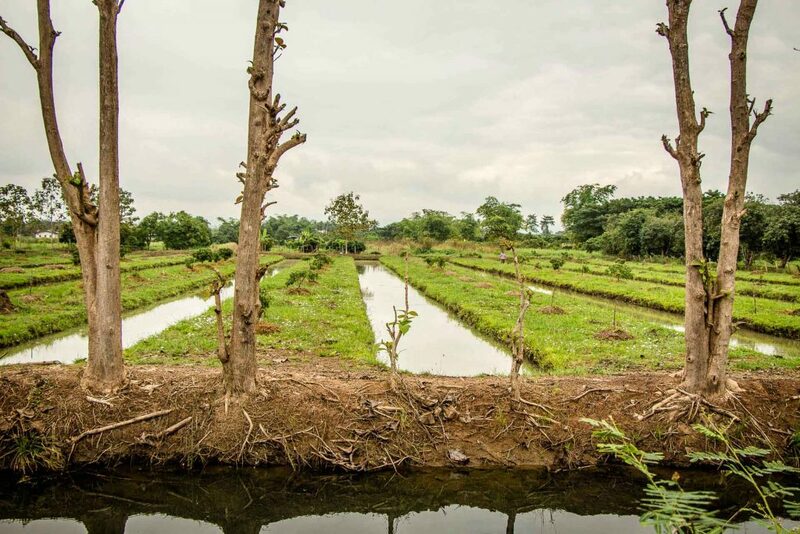 After a short rest, we left Lamphun and were soon gliding along on near deserted country roads, where local farmers grow rice, basil, chilies and a huge variety of fruit. Gun was kind enough to stop several times to let us try the produce growing along this charming country road. 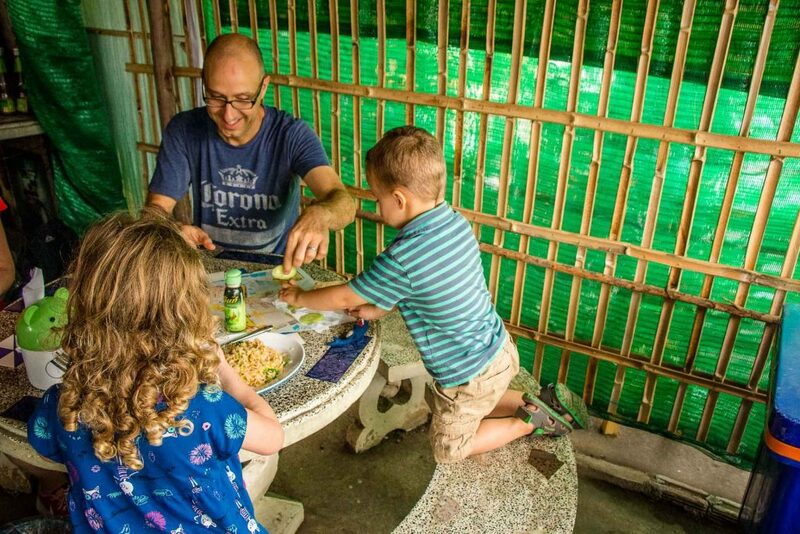 Our kids really liked trying the fruit, while we loved the smell of the fresh Thai basil, straight from the plant. This long stretch of biking was very relaxing, with very little traffic. 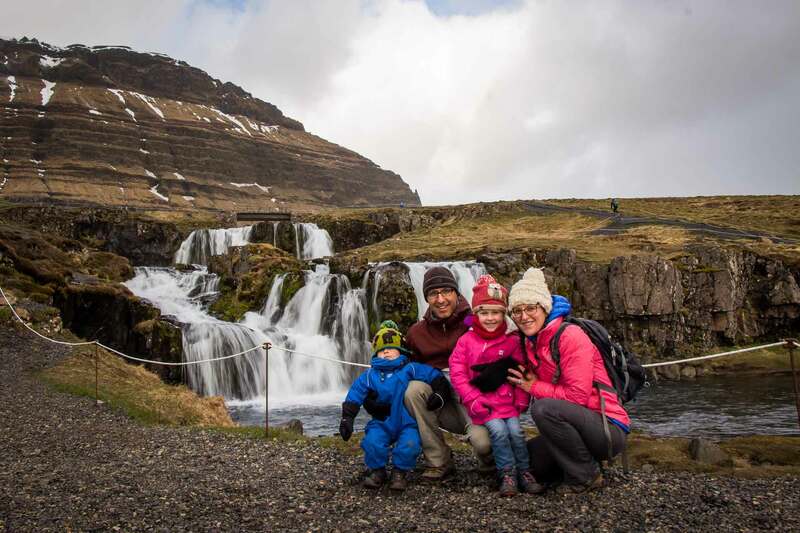 The locals we passed seemed genuinely happy to see us and were full of smiles and waves, especially for our kids. Around lunchtime we stopped in a small village for some authentic Thai food. We stopped at the kind of local restaurant that most tourists (including ourselves) probably wouldn’t dream of going to – it just looks too local. But, we are so happy we stopped here; the food was amazing! We had a red curry, basil pork, crunchy pork and papaya salad. The kids were given an omelet with fried rice, along with a large platter of papaya and pineapple for dessert. Our Chiang Mai biking tour continued along more peaceful country roads. These are the sections of the bike ride we found most enjoyable. Even if we were able to find our own bike rentals and made our way out to the country, we’d never be able to find these picturesque back country roads around Chiang Mai. 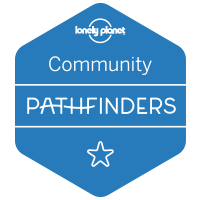 This is where booking a bicycle tour in Chiang Mai through Grasshopper Adventures really pays off vs. doing it yourself. Shortly after, we were back on the busy streets of Chiang Mai. Again, Gun did a great job keeping us off the busy streets as much as possible. 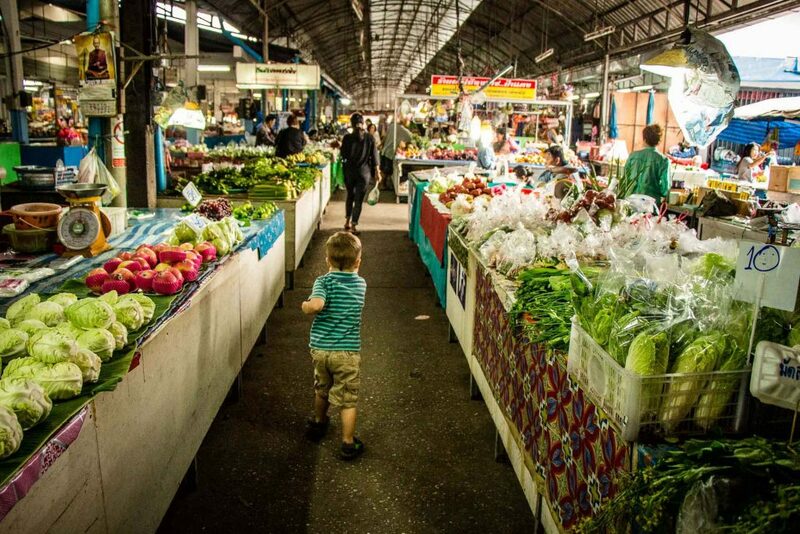 He led us to a local market where we all dismounted and walked through. I imagine the only tourists this place sees are when the Grasshopper groups come through. Gun took the time to show us many of the local produce and foods on offer. 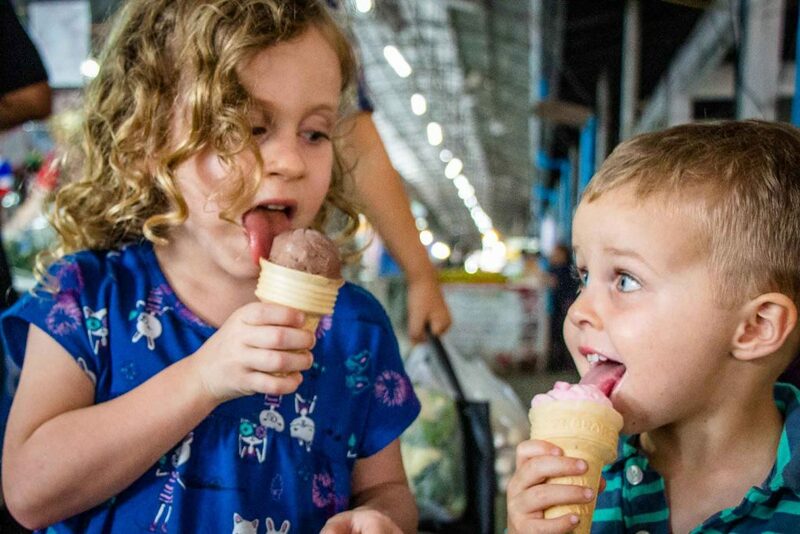 Our kids thought he was the greatest when he bought them each an ice cream cone! Soon we were off to our final destination, the Wat Umong Mediation Center. The ride to the mediation center goes up a series of modest hills through a very scenic forest. 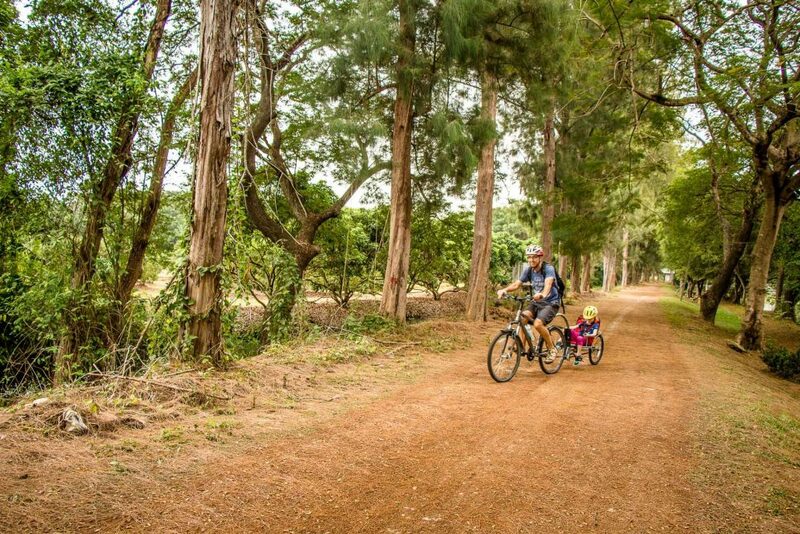 The hills were a bit of a challenge with the kids in tow, but anyone in reasonably good shape will be able to do them, especially with an 18-gear mountain bike. The meditation center was very atmospheric in its beautiful forest setting. It was around 5pm and was starting to get a little dark, so the ambiance was very special as we walked around the historic buildings alongside the many monks in their golden robes. 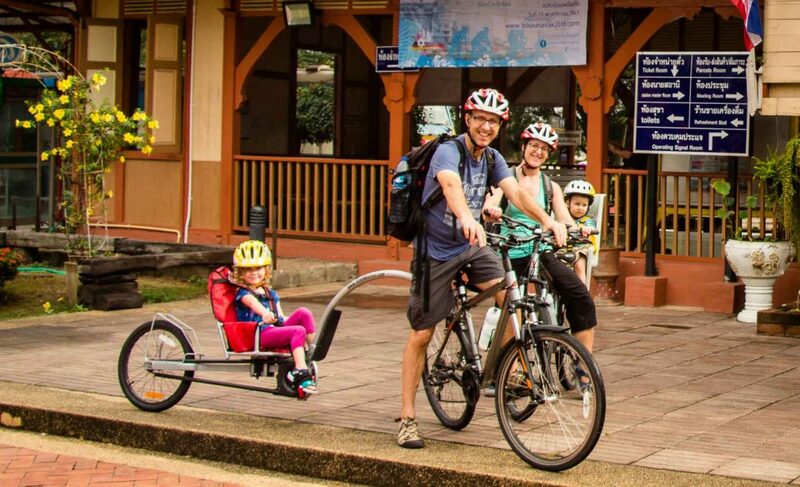 The Chiang Mai Countryside by Bike tour was such a great family outing and we are grateful to Grasshopper Adventures for hosting us! 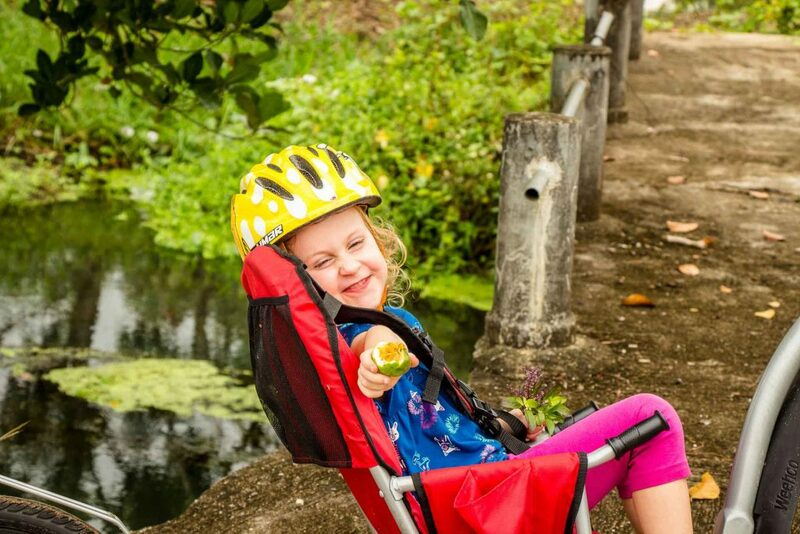 We love seeing the countryside by bike when we travel and we were so happy to find Grasshopper Adventures and their family friendly Chiang Mai excursions. 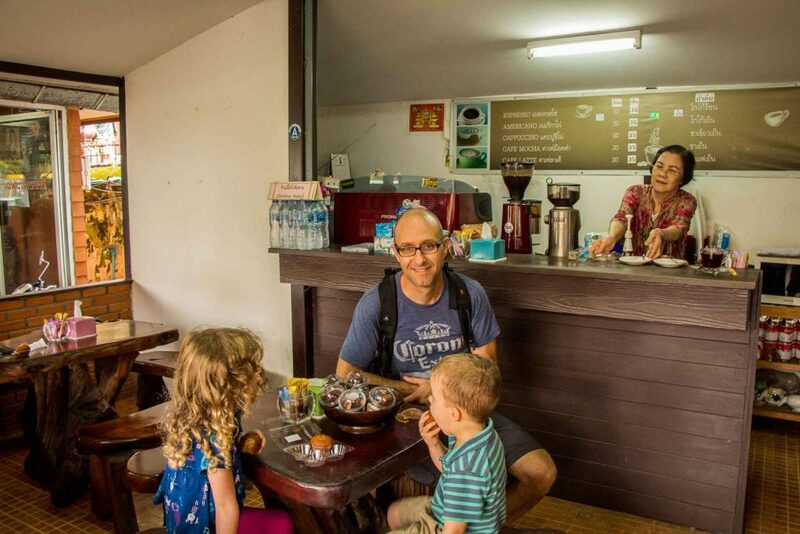 If you are looking for a great day trip from Chiang Mai, we highly recommend this one. 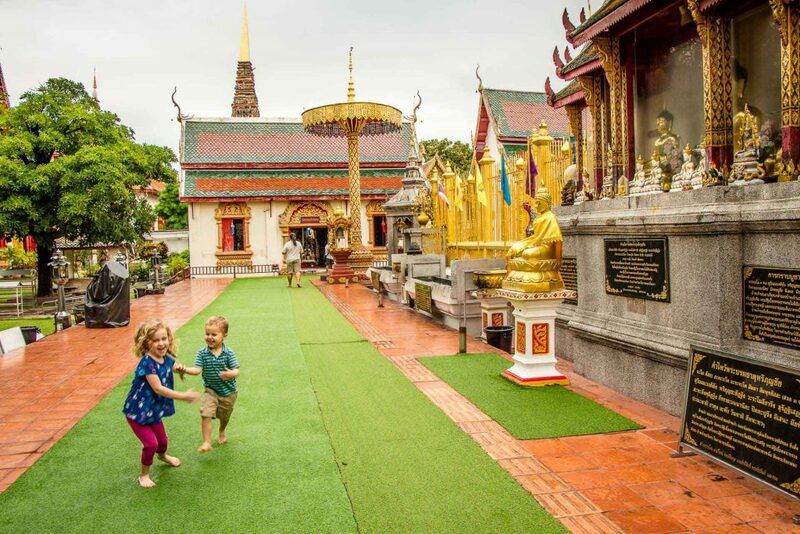 If you are looking for more things to do in Chiang Mai, see what else our family did during our week-long visit in Chiang Mai with kids. You may also like our post about our ethical elephant tour in Chiang Mai.